This carte de visite portrait features an aged woman wearing mourning clothes. Her black dress, black hat, and sad expression, all suggest that she has suffered a recent loss. Her left hand is placed on a book atop a small table. The book is likely a bible. The photographer of this cdv photograph is J. R. Bentley. He operated a studio in Edmonton, Canada. Research found an ad in “The Photographic News” (1893) in which Bentley advertises the sale of his studio. It is very interesting to note that the advertising on the reverse of this CDV refers to Bentley as a “Portrait, Landscape, & Equestrian Photographer”. I do not remember ever seeing a early photographer refer to himself as a “Equestrian” photographer. I wonder if Mr. Bentley took photos of individual horses, or if he photographed individuals sitting on horses. I hope someday I locate one of Bentley’s equestrian photographs. This vintage real photo postcard features a man and his horse and his partially covered wagon. Judging by the man’s clothing; he is a working man. Perhaps he is a delivery man of some sort. He is wearing a white shirt, bow tie and smock. I believe that he is wearing long heavy gloves. The gloves probably pertain to his occupation. The stamp box on the reverse of this postcard indicates that when it was published, the postcard postal rate was 1 cent. The one cent rate was in effect until World War I when it was raised to 2 cents on a temporary basis (1917-1919). The rate was again raised between 1925 and 1928. The rate became permanantly two cents in 1951. As a result, the stamp box in this case, is not helpful in establishing the date that this postcard was produced. However, the style of the front of this postcard indicates that it was produced not long after the 1900’s or 1910’s. This cabinet photograph looks like a scene from a Clint Eastwood western feature film. It is as if the four men are looking into the street to watch Clint challenge four outlaws to a gunfight. 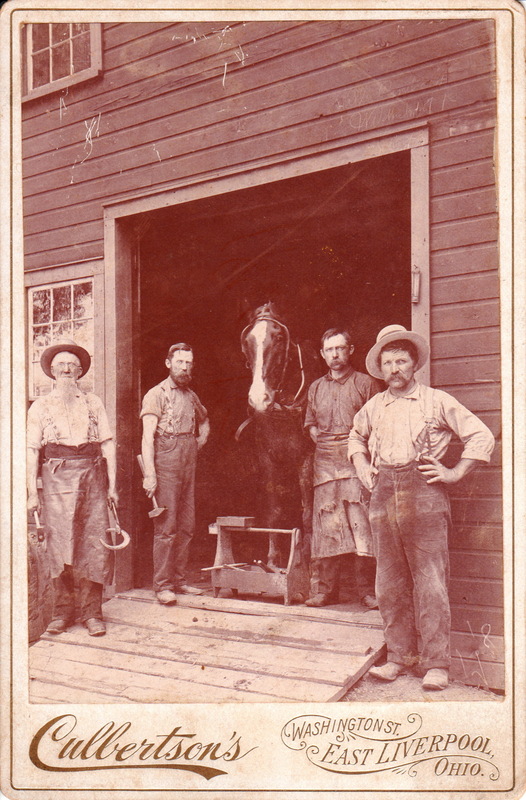 More likely, this photograph captures a portrait of four men who work in an East Liverpool, Ohio blacksmith shop. Note that two of the men are holding tools of their trade and also take notice that there is a tool box in the center of the image. In additon, two of the men are wearing aprons and all four men are wearing what appears to be appropriate blacksmith garb. In the center of the photograph is a pretty horse. The photographer of this wonderful portrait is Culbertson’s Art Studio. The Culbertson studio is associated with the seamier side of photography and created quite a scandal in East Liverpool. Harry and Leon Culbertson were brothers and at one point were business partners in the Culbertson Brothers photography studio. On 5/10/1892, Harry was arrested on a charge of taking lewd and indecent photographs. His legal defense was that the photographs were “purely works of art”.The Lowell Daily Courier (Lowell, Massachusetts) reported the story on 5/13/1892. Culbertson claimed that two unknown young woman came to his studio and induced him to photograph them “undraped”. He left town shortly after his arrest. 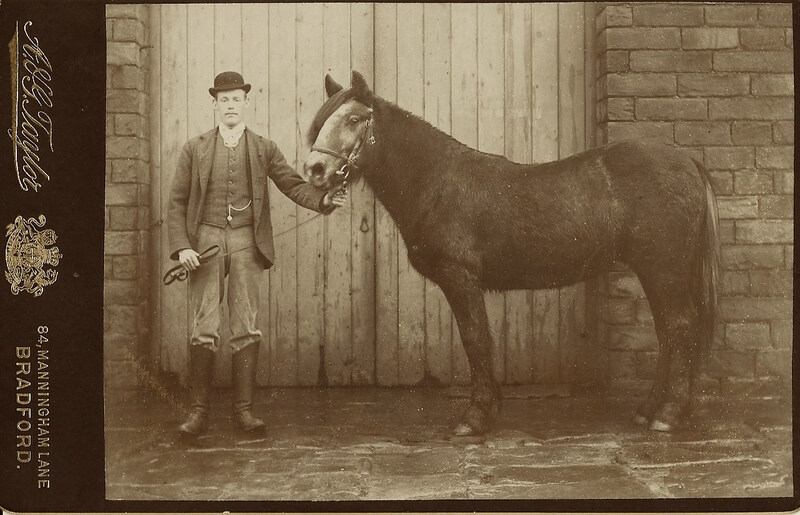 This cabinet card photograph features a man and his horse standing in front of a barn. Judging by the gentleman’s equestrian clothing and the condition of the barn, I would wager that this is a man of means. His horse is handsome and appears healthy. He is holding the reins with both hands and the tightness of the reins tells the horse who is in charge. The photographic studio that produced this outstanding photograph is A & G Taylor. This studio was one of several British studios that claimed to be “Photographers to the Queen”. Andrew and George Taylor owned the largest Victorian Photography firm in the United Kingdom. The company was started in London in the 1860’s and by 1886 the firm had branches in 36 United Kingdom cities, and in 6 cities in the United States. The studio that produced this image was located in Bradford, England. It is interesting to note that The mounting board of this cabinet card is dark green.